HomepageBlogOur European Container is HERE! It’s hard to believe: I was just in England three weeks ago. 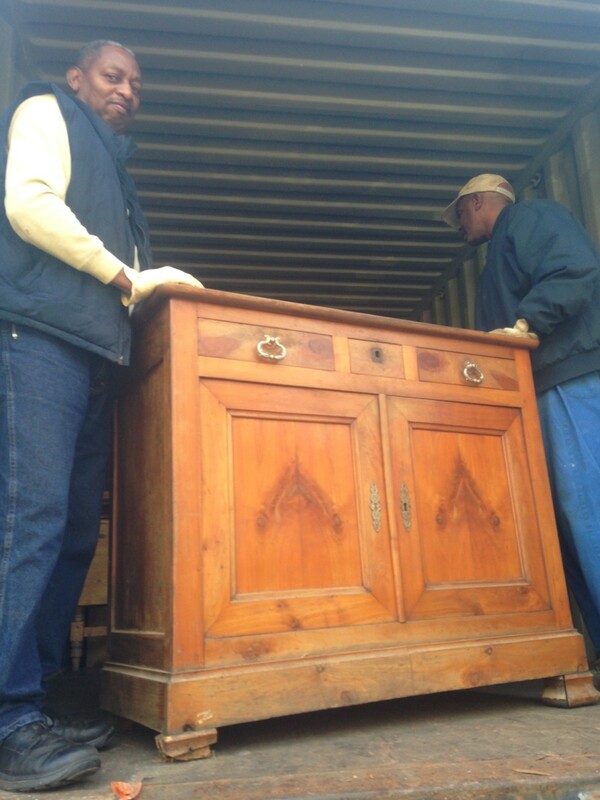 And already my container full of European finds has arrived on our shores and been unloaded. For a first-ever container buy, this has been a dream. 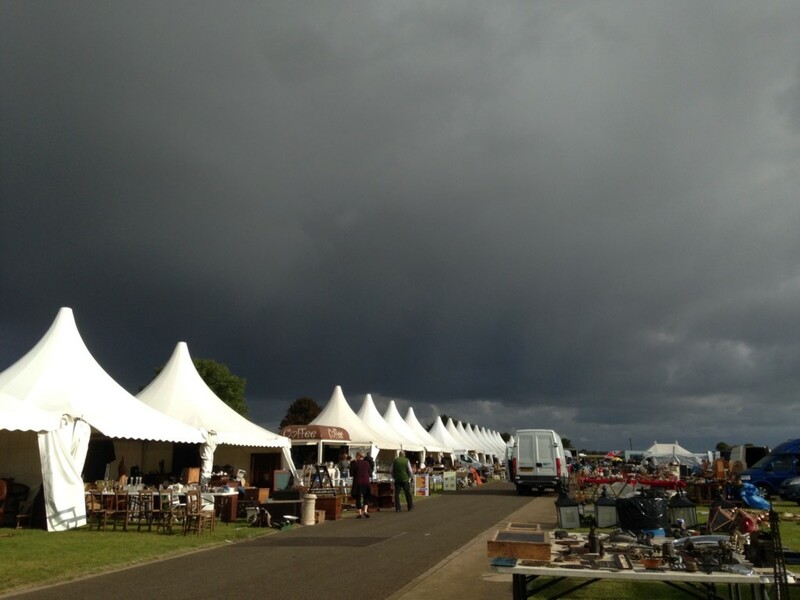 We left early in October to attend the Lincolnshire Antiques Fair and shop some nearby towns and hidden spots. The fair was set up very much like fairs here, but look how charming their tents are. And, of course, all the stuff is British and European! I was in vintage-lovin’ heaven. 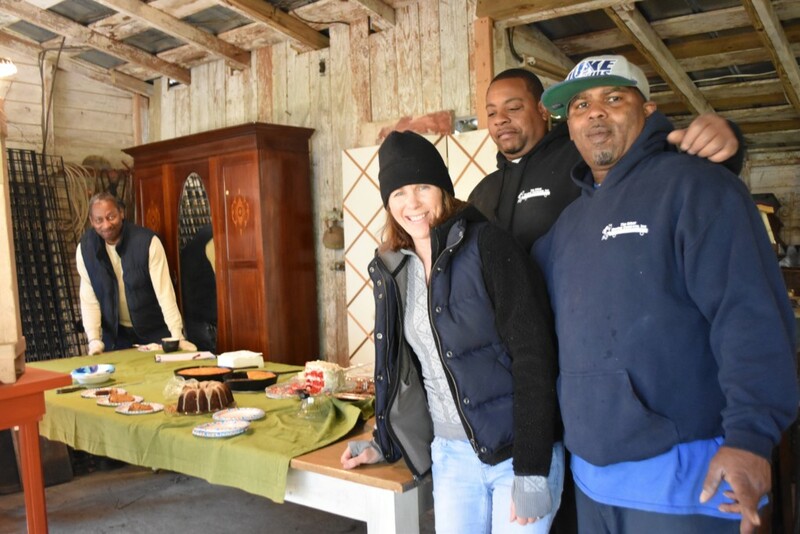 Annie, a fellow-dealerss and veteran of such adventures, introduced me to a hardworking, knowledgeable family who’ve been in the antiques business for generations. Here’s Johnny, who graciously walked the fair with me, and then followed up with his truck, packing as he went. Johnny plotting his strategy for loading his truck as we finish our shopping at the Lincolnshire Fair. Linda kept Annie’s records in great shape, and was a delightful travel companion. After the fair we headed to Johnny’s home base and storage units. 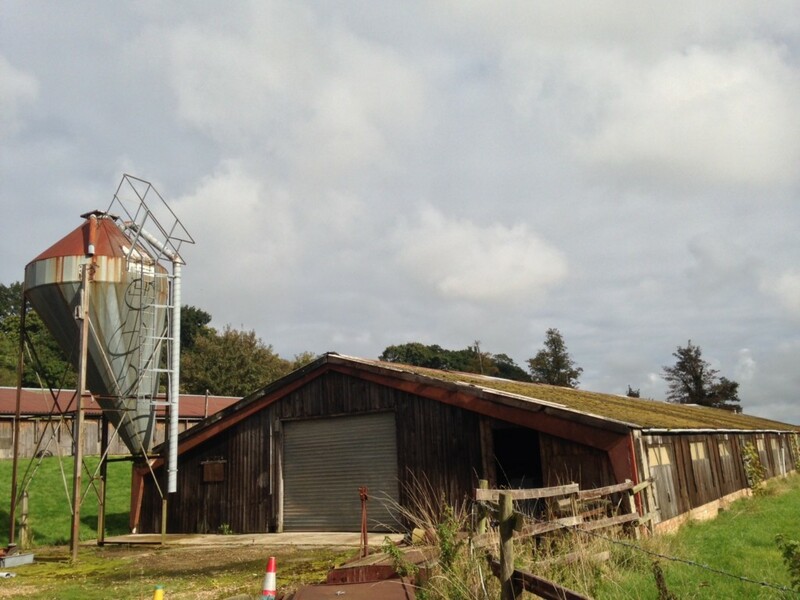 The Sheds, where we found wonderful things to bring home to you. These sheds don’t look like much, but they held some treasures! Our empty container was waiting on this property for us when we arrived. 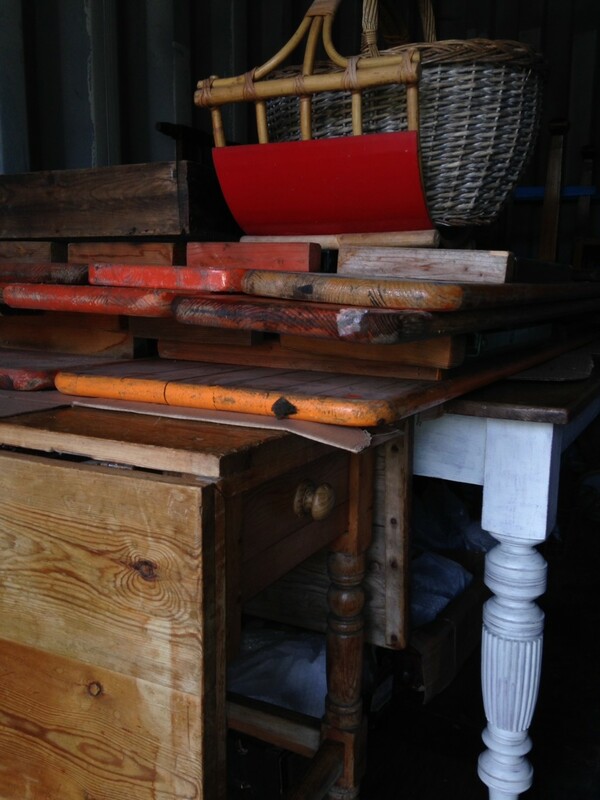 So we shopped the sheds, and then loaded all our finds onto the container. I love English flatwear – its proportions and weight are the best in the world. And I found a huge cache of it! 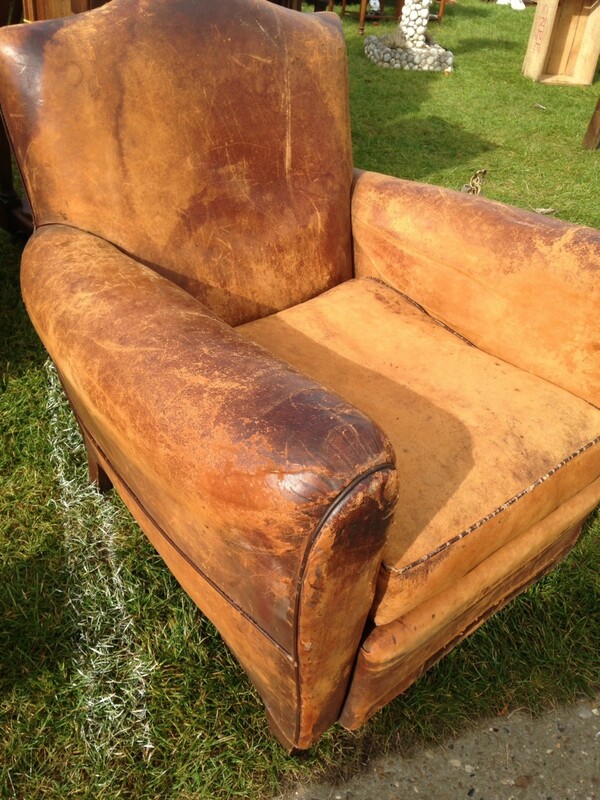 A genuine, leather, French club chair. Its a perfect specimen. With the serious shopping portion of our trip complete, the container was filled and ready to head to America. With our container ready for the high seas, we parted ways with Johnny’s family, Annie, and Linda, and went exploring on our own. Our intrepid little car. With the steering wheel on the right-hand side. And the shifter on the driver’s left. But it got us where we wanted to go. We ‘let’ a cottage in the Cotswolds. 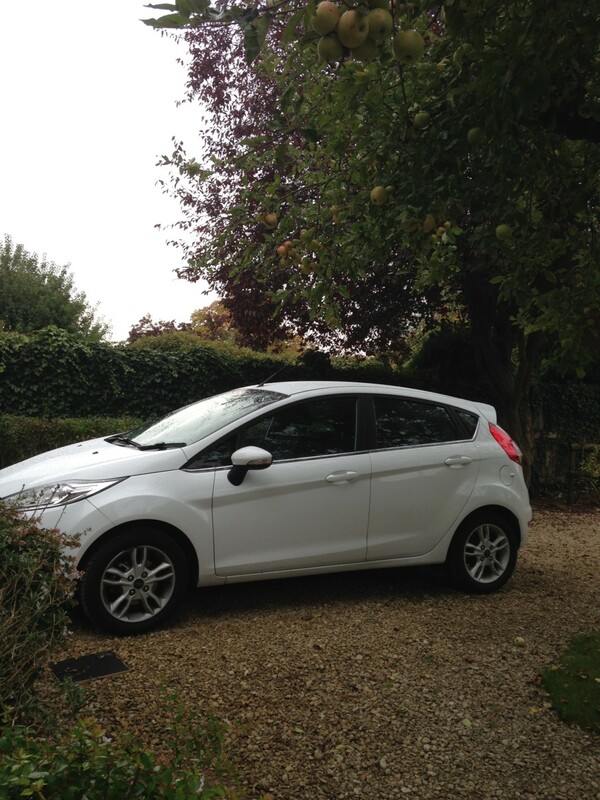 With a delightful home-base awaiting us every evening, we drove off in a different direction every day in our little Ford Fiesta. 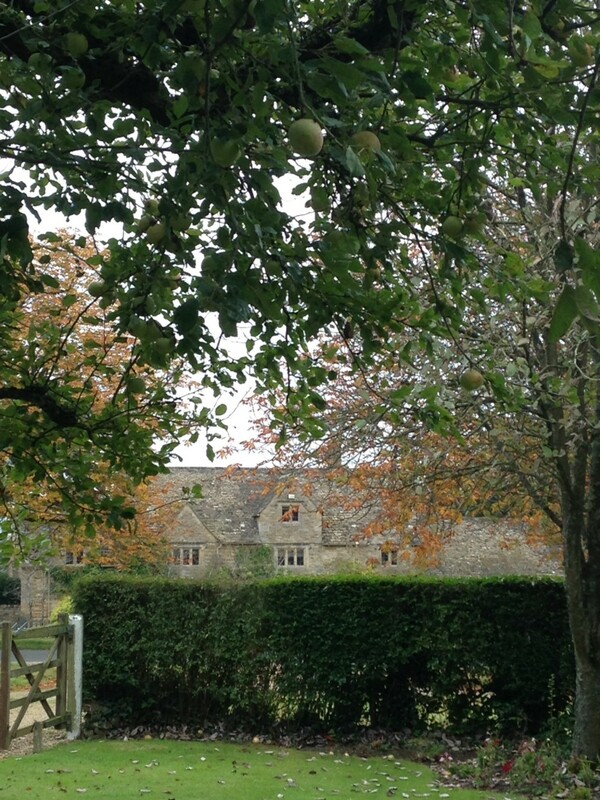 The view from the front windows of our cottage in Wick Rissington. This was my first airbnb adventure. If they’re all this great, I’ll never travel any other way if I can help it! I’ll post more about our travels, but thought I’d just include a few images here to give you an idea of what we were up to. 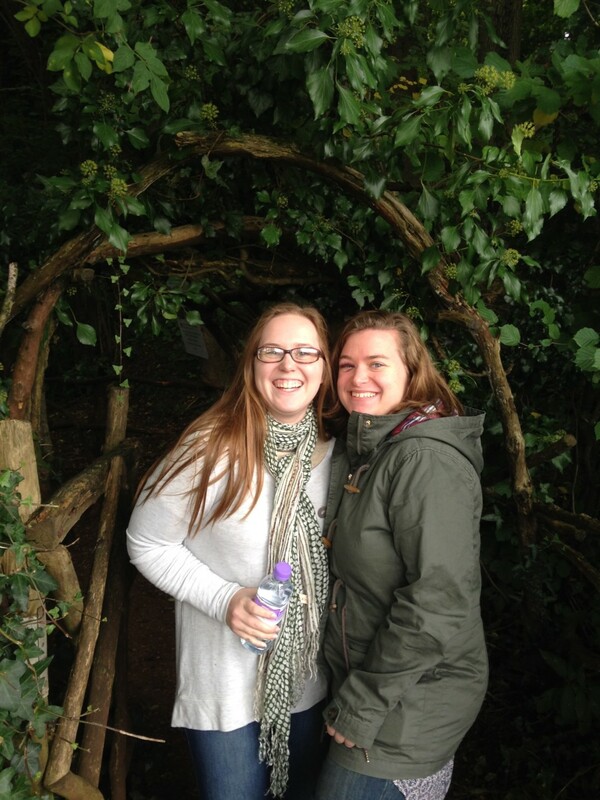 My travel companions: Katherine and Caroline. Here they are at the entrance to the Puzzlewood Forest, said to be and inspiration for Tolkien and more recently a location for the upcoming Star Wars film. 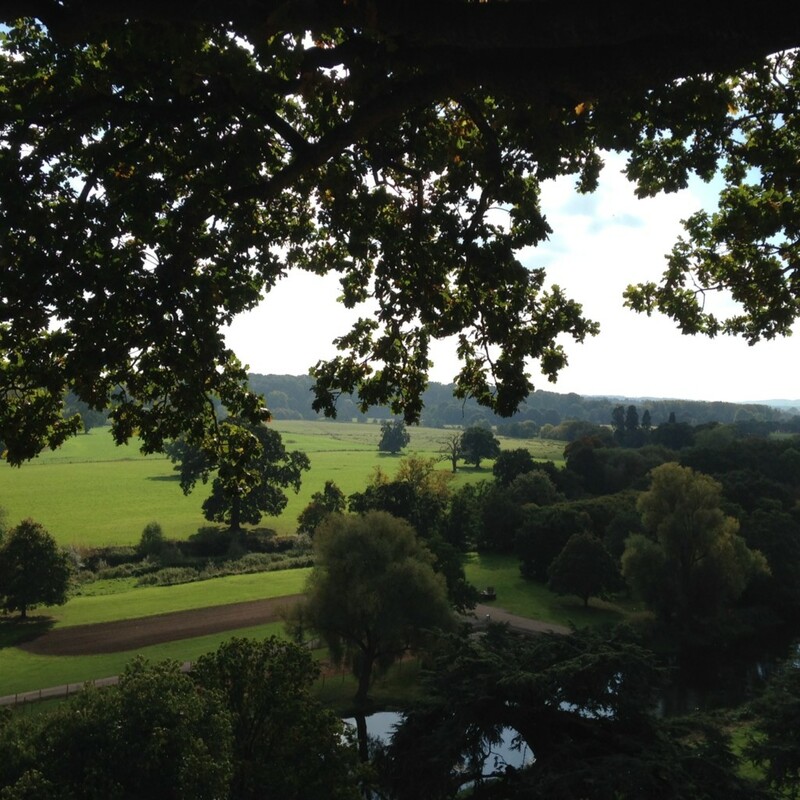 England is full of views like this. And I never get tired of them. 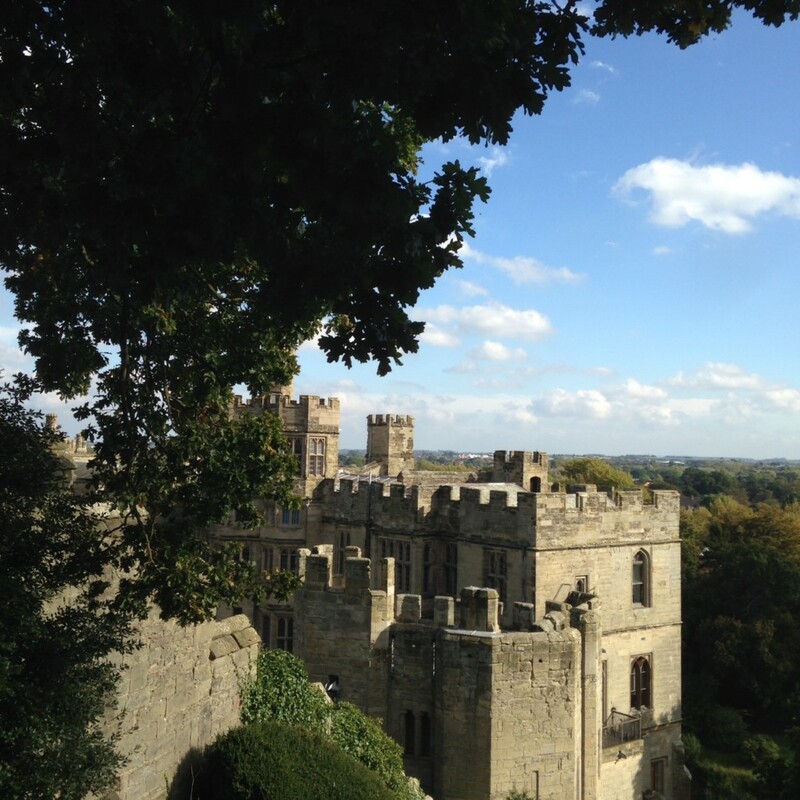 One of my favorite things about the British landscape: castles. 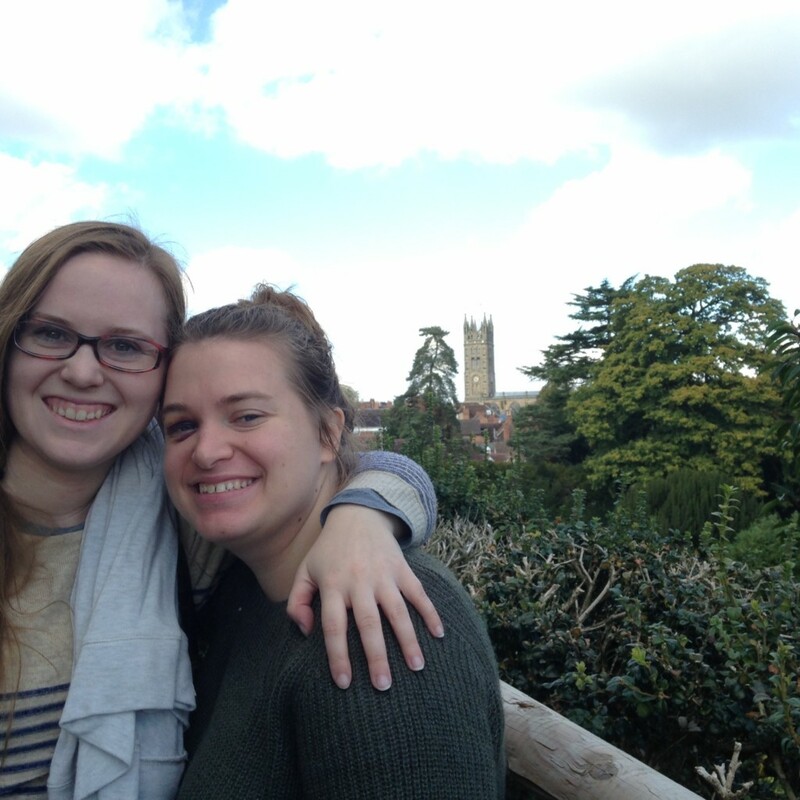 Here are the girls on the walls of Warwick Castle, with the town and church in the background. 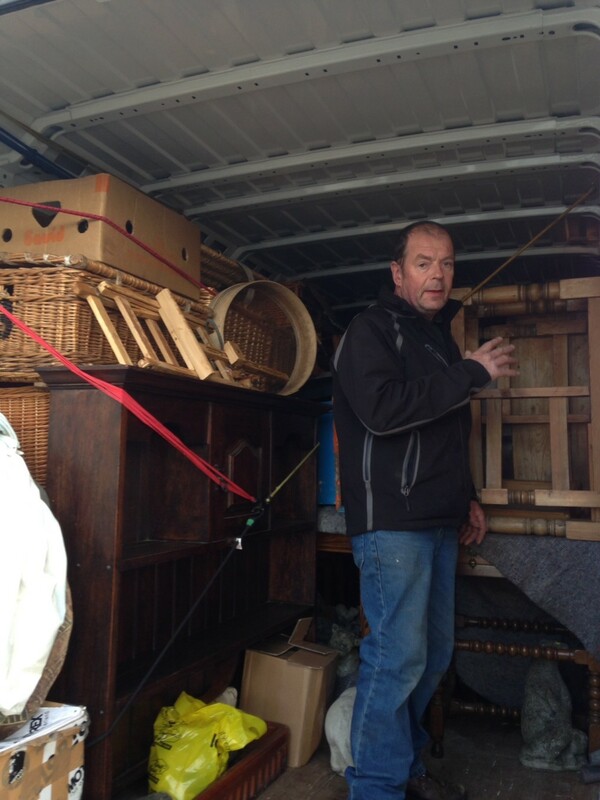 Leaving England mid-October, just in time to get ready for our October Tag Sale, we came home and got right back into our monthly routine, hoping our container and its precious cargo wouldn’t take too long to arrive. We weren’t disappointed. Annie had told me to expect it within a month, and Tuesday we got the word that it would arrive at her place in Virginia on Thursday. 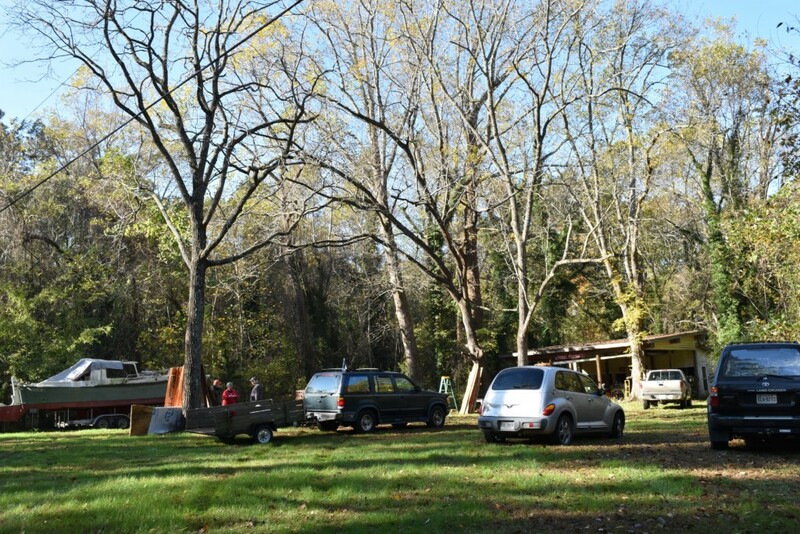 We quickly ordered our UHaul for pick up in Virginia, and headed down to Annie’s place. You’d think having returned from England and all our buying, that the fun part of the adventure was over, and that all we had left was hard work. That would be true if Annie weren’t involved. But Annie was involved, so it became a party. At her spectacularly beautiful riverfront home in Virginia. It was a reunion of our traveling friends, Linda, her husband and Annie’s husband. And we added to that, Chip, my dear husband who missed the transatlantic trip, but joined me on the excursion to pick up our loot. Annie’s riverfront home is spectacular. I really have no idea why she ever leaves! 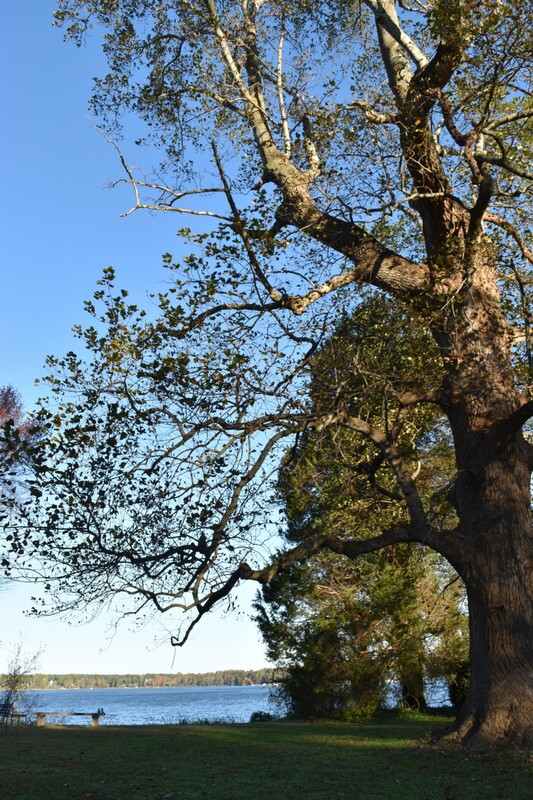 This 200-year-old tree is just one example of it’s rare beauty. When we arrived Wednesday night, it was dark, we’d been driving for hours, and were exhausted. 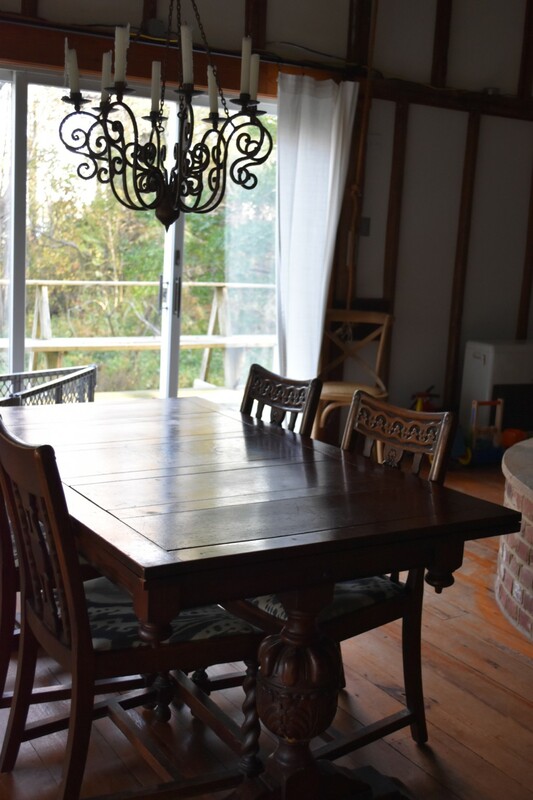 When Annie showed us into the ‘guest cottage’ it was an inspiration (even in our weary state)! It was a smaller version of our own barn, but completely renovated and made livable. 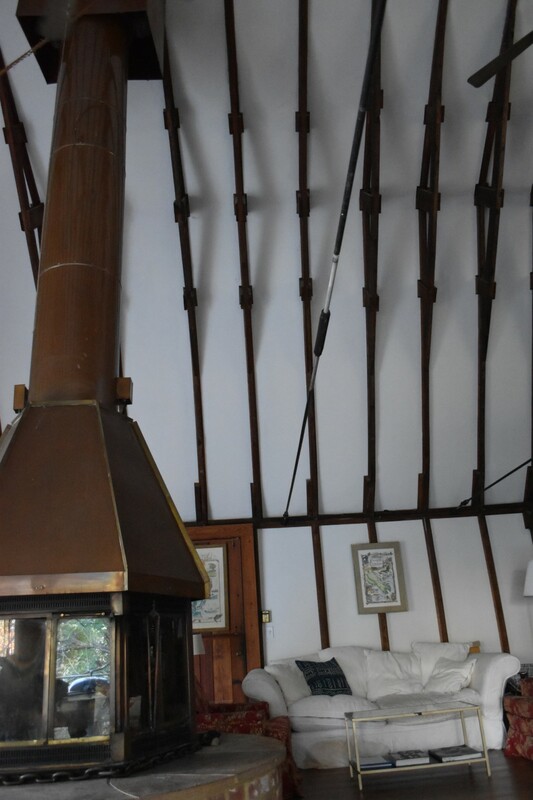 That fabulous chimney you see there is completely made of copper. This charming, vintage set is positioned perfectly for its view down to the river, and nestled comfortably by the central fireplace. 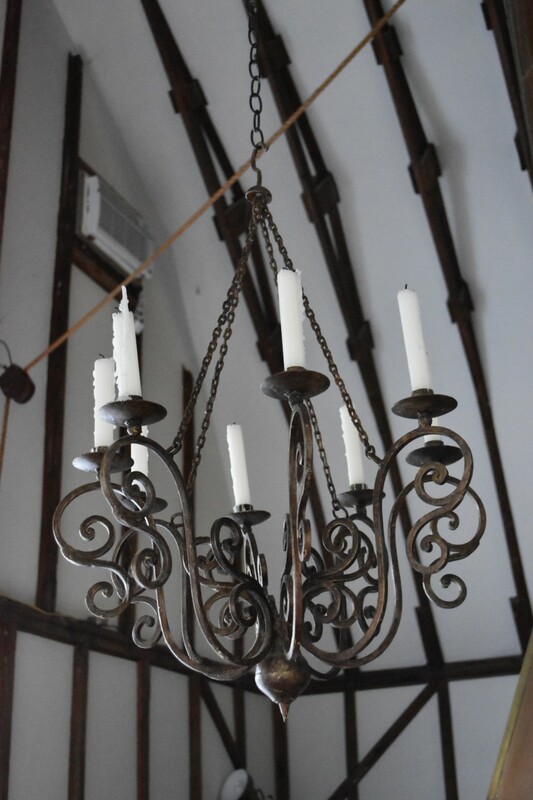 This pretty iron chandelier hangs by a heavy iron chain from the lofty ceiling. No electricity needed, these candles are old school. Love it. 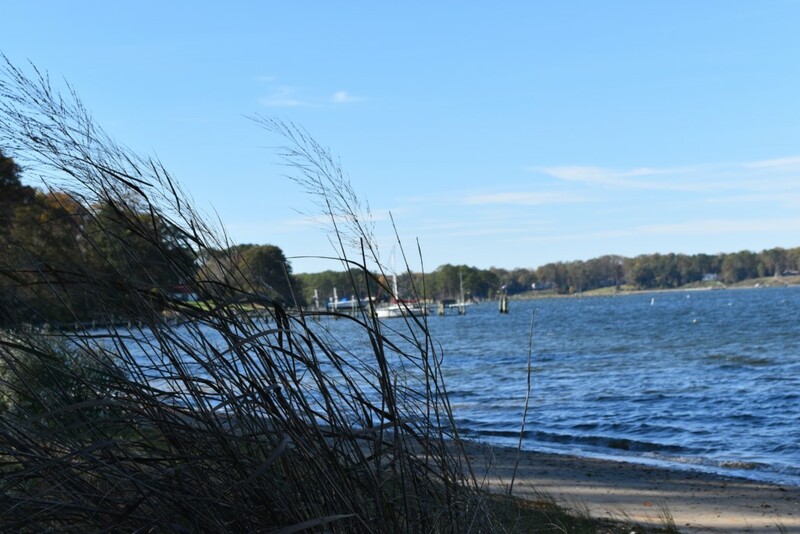 Here’s a shot of the private beach just down the hillside from the main house and barn/guest house. Truly an idyllic spot. And here she is: Annie! I love this shot because you can see on her face how warm, fun, and enthusiastic she is. 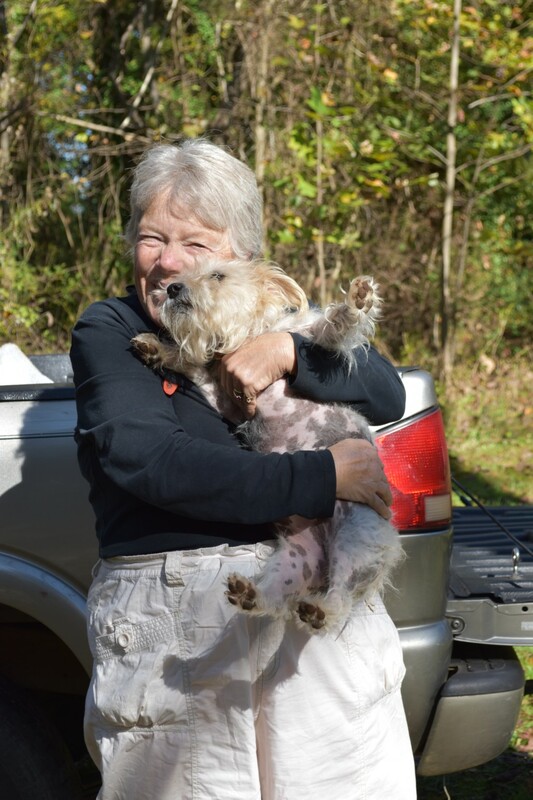 And how much she loves Zippy, her adorable little terrier. It takes a village – Annie’s team assembles on the lawn by her shed as we prepare to unload the container. Annie assembled a fabulous crew of hardworking, professional guys, and a few fellow-dealers/interior design lovers, to help empty the container. Pictured here with the delicious lunch Annie’s husband, Neil, prepared for all of us. 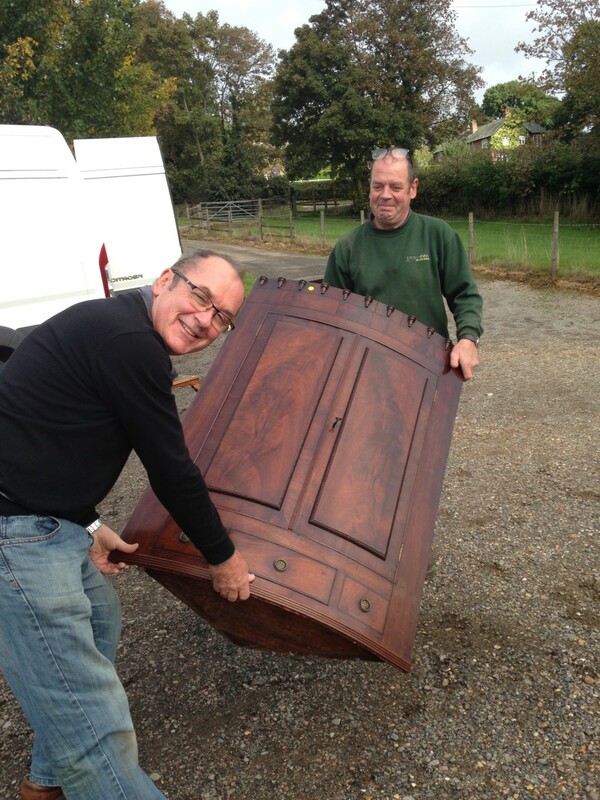 Here comes my French chest off the container! These guys were hardworking, and were indulging my need to document everything with my camera. Here it is, ready to be loaded on the UHaul and head home. 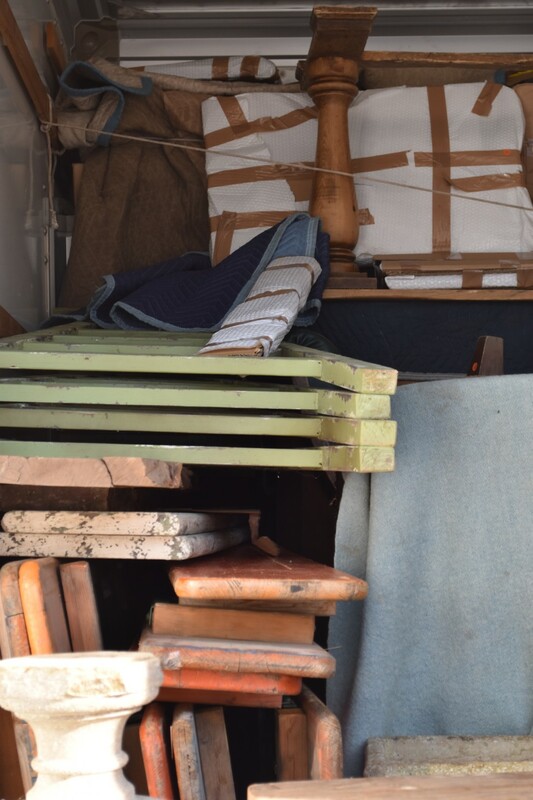 This set of three German beer fest tables was all I could fit on the truck in Lincolnshire – next time I’ll be prepared and get a whole lot more! While I was photographing the unloading, Chip and Harry (Linda’s husband) headed out to get our UHaul so that we could get our treasures home. Opening the UHaul this morning to get a look at all the loot felt like Christmas morning. Four hours, and many, many miles later, we arrived home last night with our haul. But it was only this morning that we opened it up and began carrying things into our barn. This leather French club chair is the real deal: from an actual club in France, with that inimitable wear, softness, and style. LOVE it. The English factory carts are a bit smaller than American ones, and are a nice size for a coffee table. 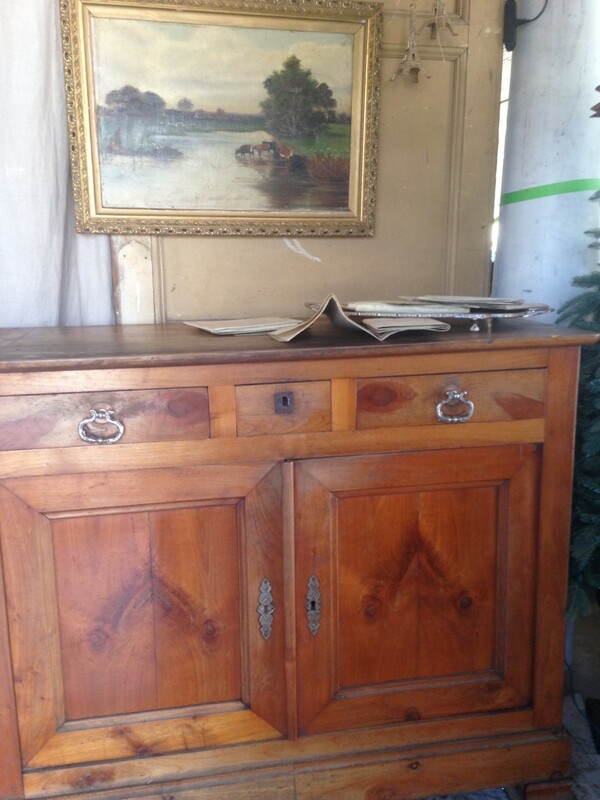 The proportions, lines, and patina of this beautiful French chest make it a beauty. I can’t wait to start decorating it. This piece just tickles me. 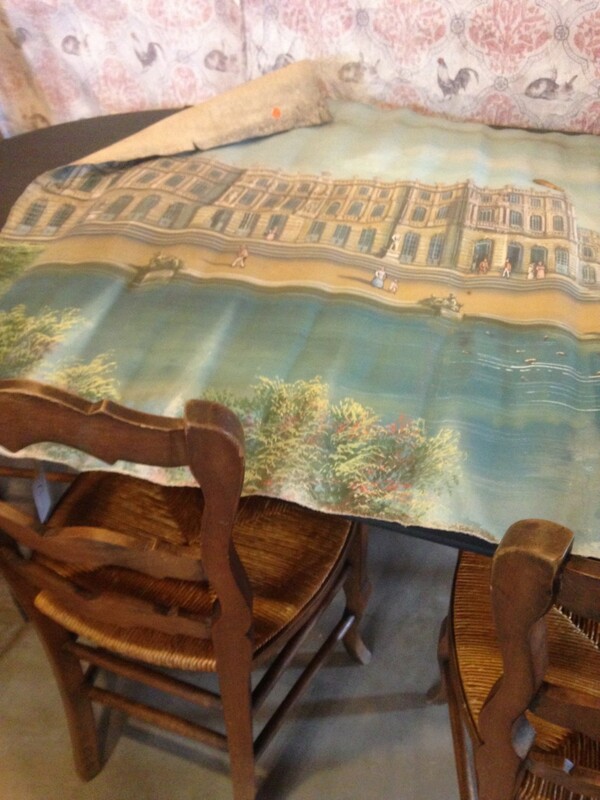 It’s a 4′ wide canvas depicting Versailles circa 1900. I’m not sure if it’s a prop or promotional image. But it’s just so cool! 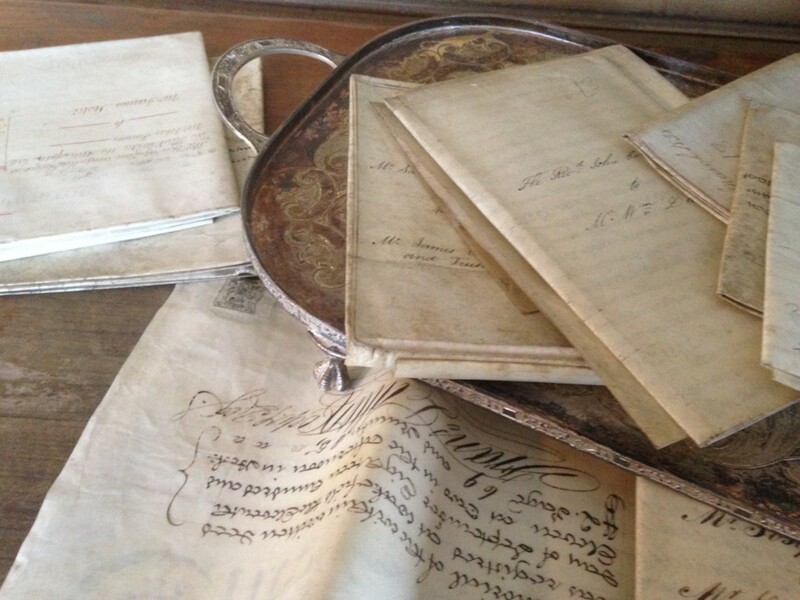 These are possibly my favorite find: hand-written deeds, mortgages, and indenture from the 18th and early 19th century. Their wax seals are still on them. Amazing pieces of the personal history of British subjects from hundreds of years ago. And beautiful, too. There’s lots more to unpack and put out, but I just wanted to share this much with you. It’ll all be ready for our opening November 18-20 (next weekend!). Now I’ve got some work to do! “How was it?” everyone asks. It was almost a blur. Going back through these pictures (which are just a handful of what I actually took) makes me realize what a whirlwind it was. I learned a lot of what to do and what not to do. And I’ll definitely be doing it again. I’ve already got my strategy worked out and some tentative dates on the calendar. This time was a bit of a trial, never having had the guts to do a container shipment before. Now that my appetite is whetted, I’m hooked! We did have a GREAT time!! Though I have no English blunderbusses on the load, there are some fabulous items I found, like 18th century, hand-written deeds and mortgages with their wax seals still attached, British skeleton keys of all shapes and sizes, English silverware and faux ivory. Plus all the great furniture and artwork. Wow! and bravo to you, Virginia, for taking this huge step. It looks like a fabulous experience for you, your daughter and niece – and with fabulous results. Here’s hoping you continue on these forays! Can’t wait to see the “loot” in person. Thanks, Shawna. It was tremendous fun! I hope to do it again sometime soon! Wonderful!! 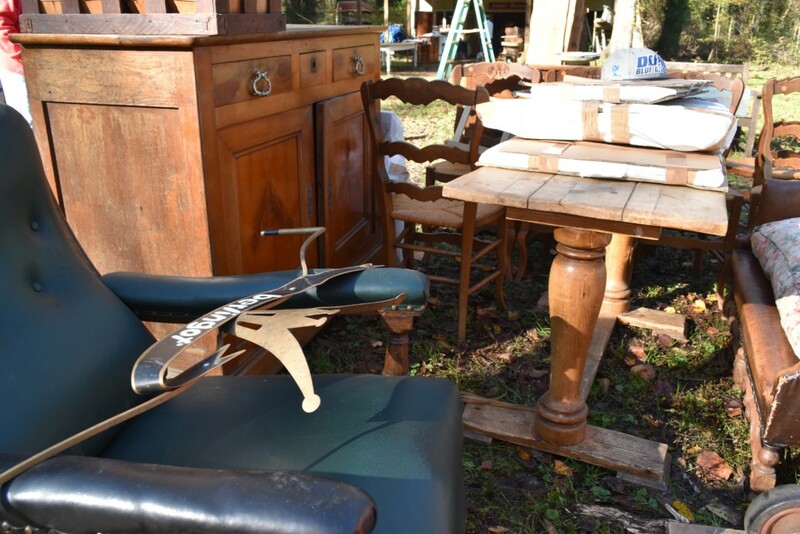 Are you planning to sell the French club chair? If so, we’d be interested. 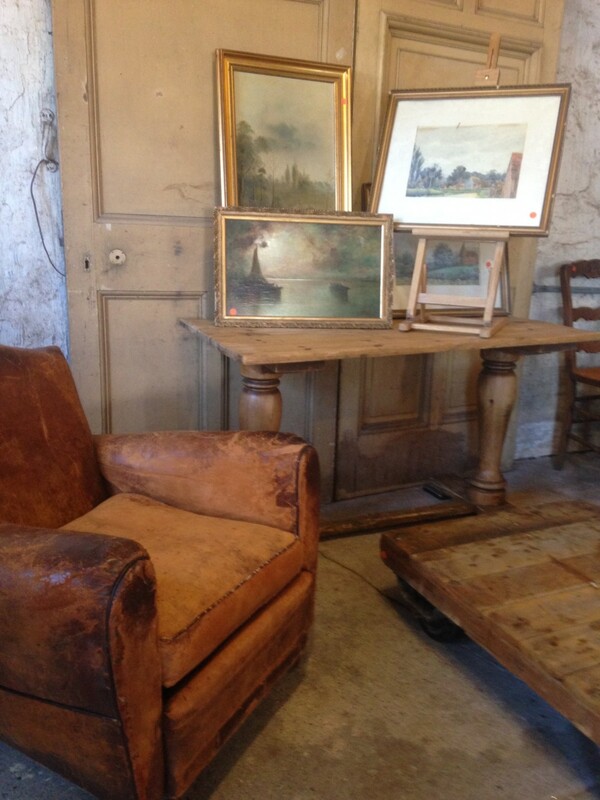 Yes, that fabulous club chair is among the items available for sale this coming Friday-Sunday. Lovely photos. Got me excited to see what else you have. 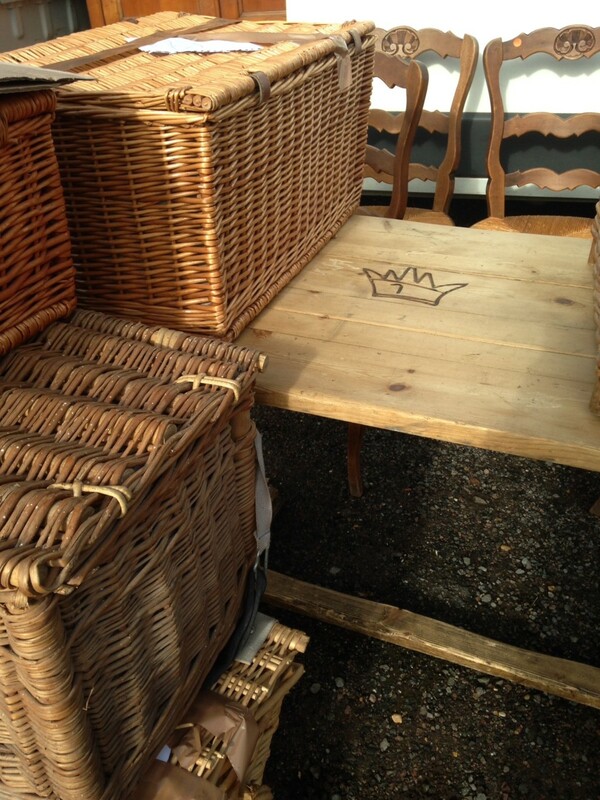 I’m looking for 6 dining chairs to go with a large pine tressle tableI. I saw some I liked in your photo on the “Event Schedule.” and hope that are still available. I did bring a set of 6 rush-seat, French provincial chairs from my English trip. They’re on this container. But I got only the one set, so when they’re gone, they’re gone. Next time I’ll find more! Jealous of that buying trip!!! Of the beer fest tables and benches are there any with red or blue benches, do they all have green table legs and will they be available this sale and also would you be able to pm or email me a price. Made the last two sales including Holeday but unfortunately can not get there for this one but do need a beer fest set. Thanks for your help. Great to hear from you, Pam. 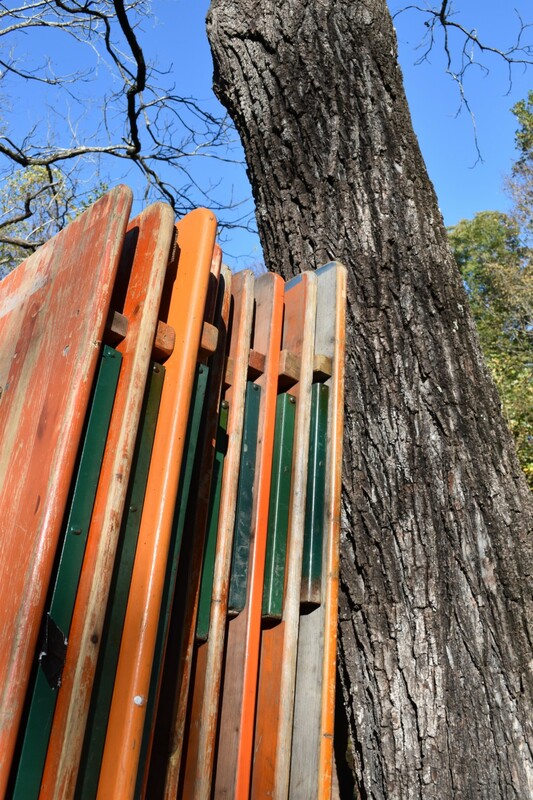 Yes, all the beer fest tables are orange with green metal legs. There are just three sets (that’s all we could fit in our truck!) and they’ll be $295/set. Great pics and narrative Virginia! Your poetic eye launches us into a world of creative decorating quite masterfully. As always, your descriptions are “spot on” and the photos hint at the many magic moments and scenes you must have enjoyed on your trip. 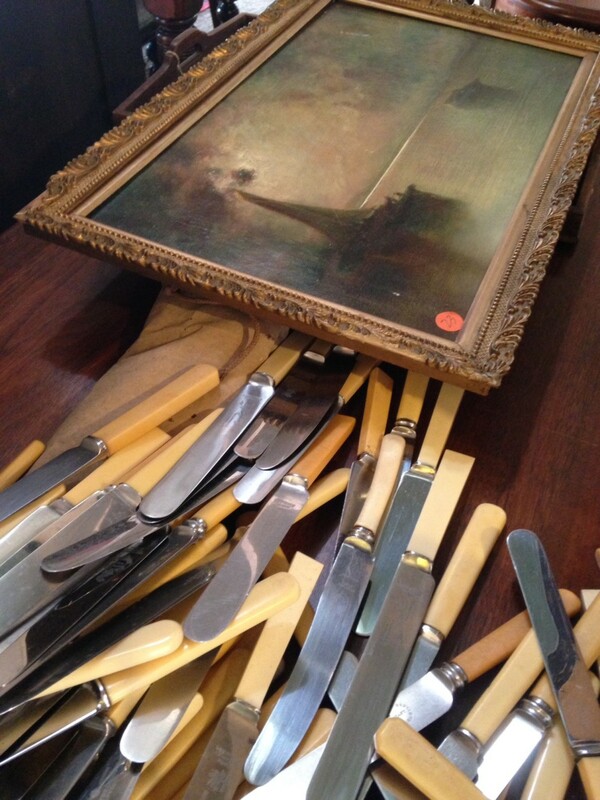 Perhaps there’s a Virginia’s “Chartreuse European Antiquing Tour” for the rest of us, somewhere in the future. What fun that would be! 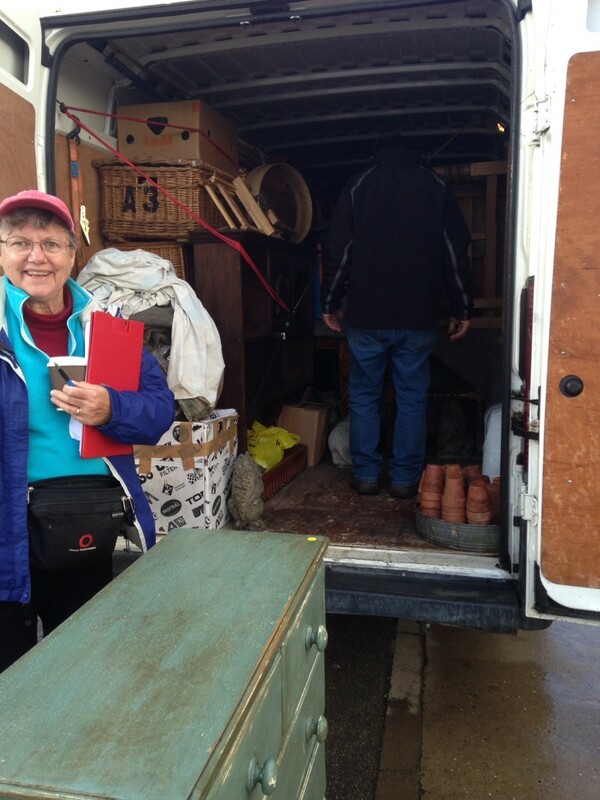 Looking forward to seeing all of your exciting container finds! Thanks, Ric! It was a blast!!! I should consider that – it would be a hoot! Oh, Miss Virgina, you have such a beauteous manner of describing your journey through my homeland in England. I look at your pictures longingly since I haven’t traveled home in over 25 years. If you go back sometime, you must go visit my older brother Hermone in a small hidden town called Brisborne Flats in the southern province of England where he has a smashing outbuilding piled high with eighteenth century antiques. He would love to entertain you with his tall tales and whimishes of his antics over the years. I miss him dearly. Best wishes for your success and health in your sale. I will keep watching your website for more loveliness! Thanks for your lovely message, Katarina! I LOVE finding small, hidden towns. When I go back, I’d love to look up your brother! Could you email me his contact information? My email is [email protected].